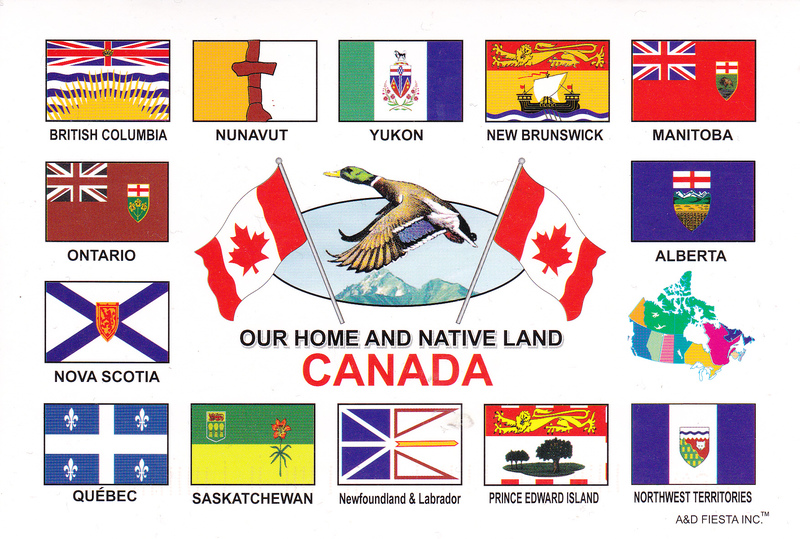 This wonderful card showing the flags of all the states and territories in Canada. It arrived a few days ago and made my day as it is a really special one. Canada is another country that is very high on my travel bucket list and I do hope to make this dream come true very soon. 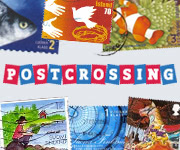 Below you can find some small stories about these beautiful and sometimes unusual flags that you can see on the card. Enjoy reading. The flag of British Columbia is based upon the shield of the provincial arms of British Columbia. At the top of the flag is a rendition of the Royal Union Flag, defaced in the centre by a crown, and with a setting sun below, representing the province’s location at the western end of Canada. The flag of Nunavut was proclaimed on 1 April 1999, along with the territory of Nunavut in Canada. And must be one of the youngest flags on the planet. It features a red inuksuk—an Inuit land marker—and a blue star, which represents the Niqirtsuituq, the North Star, and the leadership of elders in the community. Unfortunately, the blue star is missing on the flag on the postcard. The colours represent the riches of the land, sea and sky. It was adopted following a process where input was sought from local communities and submissions were solicited from the Canadian public. The flag of Yukon is a green, white, and blue tricolour with the coat of arms of Yukon at the centre above a wreath of fireweed, the territorial flower. An official flag for Yukon was created during the 1960’s, a decade in which the national flag of Canada was chosen as well as several other provincial flags were created. The flag of Yukon was officially selected from a territory-wide design competition in 1967, with the winning design adopted on March 1, 1968. The flag of New Brunswick is a banner modelled after the province’s coat of arms and was adopted by proclamation on February 24, 1965. The flag has the proportions 8:5. A gold lion on the red field across the top one-third of the flag represents New Brunswick’s ties to both theBrunswick region in Germany and (the arms of) the Monarch of Canada. The lower two-thirds of the flag depicts a Scottish Lymphad, the traditional representation of a ship in heraldry. It represents shipbuilding, one of the province’s main industries at the time the coat of arms was adopted and throughout much of the province’s history. The flag of Manitoba is a variation of the Red Ensign which bears the shield of the provincial coat of arms. This flag was approved by the passage of a bill in the Manitoba Legislative Assembly on May 11, 1965. Queen Elizabeth II having given permission for the use of the Union device in October 1965, it was officially proclaimed on 12 May 1966. The decision to adopt the flag was made after the federal government decided to replace the Canadian Red Ensign with the Maple Leaf flag. The flag of Ontario was adopted under similar circumstances. In 1968, the Alberta government authorized the design of an official flag. On 1 June 1968, the flag of Alberta was adopted. The provincial colours, adopted in 1984, are blue and gold (deep yellow); they are also referred to as “Alberta blue” and “Alberta gold”, appearing on the flag/shield in the sky/background and wheat background, respectively. The current flag of the Northwest Territories was adopted in 1969 by the Legislative Assembly of the Northwest Territories. The flag of Prince Edward Island is a banner modelled after the provincial arms and was adopted in 1964. The upper third of the flag features the English heraldic lion which appeared both on the coat of arms of Prince Edward, Duke of Kent, for whom the province is named, and on that of King Edward VII. The lower two-thirds show an island on which appear three small oak saplings (on the left) – representing the three counties of PEI (Prince, Queens, and Kings) – under the protection of a great oak tree which represents Great Britain. This symbolism is also reflected in the provincial motto, Parva sub ingenti (the small under the protection of the great). The flag of Newfoundland and Labrador was introduced in 1980, and was designed by Newfoundland artist Christopher Pratt. The blue triangles are meant as a tribute to the Union Jack, and stand for the British heritage of Newfoundland and Labrador. The two red triangles are meant to represent the two areas of the province—the mainland and the island. The gold arrow, according to Pratt, points towards a “brighter future”; the arrow becomes a sword, honouring the sacrifices of Newfoundlanders in military service when the flag is draped as a vertical banner. The red triangles and the gold arrow form a trident, symbolizing the province’s dependence on its fisheries and the resources of the sea. The flag of Saskatchewan features the armorial bearings (coat of arms) in the upper quarter nearest the staff, with the floral emblem, the western red lily, in the fly. The upper green half of the flag represents the northern Saskatchewan forest lands, while the gold lower half symbolizes the southern, prairie wheat-fields. The flag of Quebec, called the Fleurdelisé, was adopted for the province by the government of Quebec, during the administration of Maurice Duplessis. It was the first provincial flag officially adopted in Canada, first shown on January 21, 1948, at the Parliament Building of the National Assembly in Quebec City. The flag of Nova Scotia, created in 1858, is a banner of the coat of arms of Nova Scotia, which were granted to the Scottish colony by Charles I, in 1625. The flag of the modern Canadian province, a blue saltire on a white field (background), is a simple figure-ground reversal of the flag of Scotland (a white saltire, Saint Andrew‘s cross, on a blue field, charged with an inescutcheon bearing the royal arms of Scotland, a gold shield with a red lion rampant surrounded by a royal double tressure (a double border decorated with fleurs de lis). The royal arms do not appear on Scotland’s flag – they were added to Nova Scotia’s to distinguish the flag from the Russian Navy Ensign which is also a blue saltire on a white field. The similarity to the Scottish flag reflects the province’s name, which is Latin for “New Scotland”. Nova Scotia was one of the few British colonies to be granted its own Coat of Arms, and the flag is the only one of the original Canadian provinces dating back to before confederation. The flag of Ontario was enacted by the Flag Act on May 21, 1965 in the Legislature of the Province of Ontario. The flag is a defaced Red Ensign, with the Union Flag in the canton and the Ontario shield of arms in the fly. This flag is very similar to the flag of Manitoba. For every received card I will send one in return!